Use in patients with severe hypoxemic respiratory failure from acute respiratory distress syndrome (ARDS). May be used with other clinical factors to help select patients for extracorporeal membrane oxygenation (ECMO). Patients with severe hypoxemic respiratory failure from acute respiratory distress syndrome (ARDS). May be used in conjunction with other clinical factors (e.g. age, comorbidities, etiology of respiratory failure, presence of other organ dysfunction, duration of endotracheal intubation) to help determine whether a patient may benefit from extracorporeal life support. Indicates severity of ARDS; should not be used by itself to determine candidacy for ECMO. Should not be used to characterize severity of other forms of acute or chronic respiratory failure, or to assign severity to patients with ARDS manifested by severe, uncompensated respiratory acidosis. Not applicable to patients being considered for ECMO for cardiac failure. Provides a relatively standardized method of assessing severity of lung injury in the setting of ARDS and helps guide which patients may benefit from extracorporeal life support. ECMO has expanded management options for patients with severe forms of ARDS; however, optimal criteria and timing of ECMO for initiation are unestablished. The Murray Score is one system that may help guide practitioners in selecting appropriate candidates for this treatment. Patients with ARDS and a Murray Score of 3-4 may be considered for ECMO cannulation in the correct clinical setting. Patients with a Murray Score >2 could be considered for transfer to a center with ECMO capabilities. Any condition that would limit the benefit of ECMO (such as severe neurologic injury or advanced malignancy). High FiO₂ requirements or high-pressure mechanical ventilation >7 days. Once the decision is made to initiate ECMO, the patient should be transferred and managed at a center experienced at treating patients with extracorporeal life support. The following algorithm highlights the basic considerations for types of ECMO cannulation strategies based on the different pathophysiological indications. Once the patient is supported on extracorporeal life support with direct oxygenation and removal of carbon dioxide from the blood, it may be possible to apply low-volume, low-pressure ventilation strategies, which is the underlying principle for ARDS management. Adapted from the ELSO Red Book, 5th Edition (Brogan et al). The Murray Score is only a guide and should not supercede clinical judgement by clinicians about the appropriateness of ECMO initiation. In the only modern clinical trial evaluating ECMO for ARDS (the CESAR Trial in Lancet 2009), the indications for ECMO in patients with ARDS included Murray Scores 3-4 or a pH <7.20 despite optimal conventional treatment. Patients with Murray Scores >2 and P/F ratio <150 should be considered for transfer to an ECMO center. 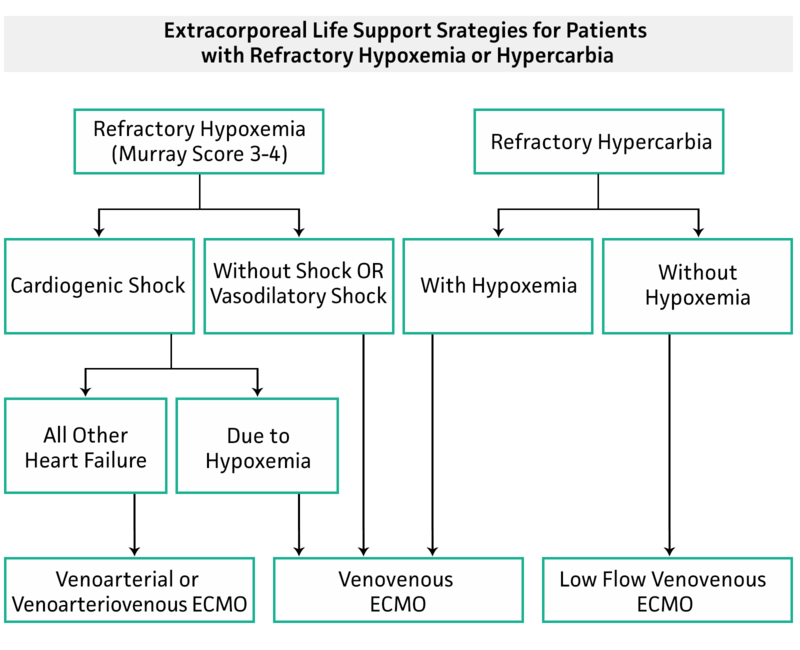 If Murray Score ≥3.0, then patient should be considered for ECMO referral. Originally developed by John Murray to assess the severity of acute lung injury in ARDS, the Murray Score was later used in the Conventional Ventilation or ECMO for Severe Adult Respiratory Failure (CESAR) trial to help determine which patients with ARDS were appropriate for ECMO. The CESAR trial is the only modern randomized trial comparing “conventional” ventilatory management for patients with ARDS to a protocolized management at a specialty center that included ECMO when deemed necessary. 180 patients were randomized, and 53% in the conventional group died or had severe disability at 6 months, versus 37% in the ECMO group (p = 0.03). Of note, low tidal-volume ventilation was used in only 70% of patients in the conventional group, and not all patients randomized to the treatment group ultimately received ECMO. Murray JF, Matthay MA, Luce JM, Flick MR. An expanded definition of the adult respiratory distress syndrome. Am Rev Respir Dis. 1988;138(3):720-3. Peek GJ, Mugford M, Tiruvoipati R, et al. Efficacy and economic assessment of conventional ventilatory support versus extracorporeal membrane oxygenation for severe adult respiratory failure (CESAR): a multicentre randomised controlled trial. Lancet. 2009;374(9698):1351-63. (ELSO). Extracorporeal Life Support Organization (ELSO) Guidelines for Adult Respiratory Failure. 2013. Gundre PR, Shah T, Kupfer Y, et al. Murray's Acute Lung Injury Score As A Predictor Of Tracheostomy In Critically Ill Patients. Chest. 2009;136(4_MeetingAbstracts). Brogan TV, Lequier L, Lorusso R et al. Extracorporeal Life Support: The ELSO Red Book, 5th edition. Extracorporeal Life Support Organization 2017. John F. Murray, MD, is professor emeritus of medicine at the University of California in San Francisco. He served as chief of the pulmonary and critical care division at San Francisco General Hospital. Dr. Murray’s research interests are focused on pulmonology.